We're here to help you with all the stages of your pet's life. The Wisconsin Humane Society regularly hosts a Pet Loss Seminar once a month at the Milwaukee Campus. The seminar includes a discussion of the grieving process for all age groups, suggestions for coping with loss and attention to special situations such as euthanasia decisions. View our calendar for upcoming dates. 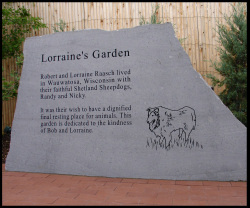 Lorraine’s Garden, located at the WHS Milwaukee Campus, is a final resting place that honors the affection and joy that pets play in our lives. This lovely setting includes a meditation garden, a memory walk and a columbarium to inter your companion’s remains. Even if you aren’t ready now, you can plan for your pets’ remains to be interred on the grounds of WHS in your own estate plans. The Wisconsin Humane Society provides a compassionate, low-cost euthanasia service. When the time is right, please contact the campus closest to you to discuss your individual needs and make an appointment. Please note that we may be able to accommodate emergency walk-ins, but if you call ahead we can better prepare for your pet's arrival to maximize their comfort. Please note that this service does not include veterinary consultation and we are also unable to accommodate requests for visitation during the procedure. We cannot return your animal's body to you after euthanasia, as home burial is not legal in many municipalities and can pose a safety risk to other animals and the environment. We do offer private cremation and return of your animal's ashes for an additional fee. If you are looking for in-home euthanasia services, please contact your veterinarian for references. This link may also be helpful; these resources are not affiliated with the Wisconsin Humane Society in any way. The Wisconsin Humane Society offers communal cremation services, as well as private cremation, at all five of our campuses. This service is available at all three campuses; no ashes can be returned to the client. We provide this service at all five campuses for families who wish to keep the remains of their pet.